The Department of Energy Office of Science’s national laboratories had 33 technologies recently chosen as 2017 R&D 100 Award Finalists. Of those 33 technologies, several were from Oak Ridge National Laboratory with an advanced energy application. Each year, R&D Magazine recognizes the most outstanding technology developments with promising commercial potential. The coveted awards – now in their 55th year – are presented annually in recognition of exceptional new products, processes, materials, or software that were developed throughout the world and introduced into the market the previous year. Lightweight, high-temperature aluminum alloys will play a vital part in improving automotive fuel efficiency in the future. Common commercial alloys soften rapidly at high temperatures, limiting how manufacturers can use them in vehicles. In contrast, alloys that can withstand elevated temperatures are prohibitively expensive and difficult to cast. ACMZ cast aluminum alloys are affordable, lightweight superalloys. They withstand temperatures of almost 100 degrees Celsius, more than current commercial alloys, while providing equivalent mechanical performance. Their properties can meet the varied demands of different automotive engine components. They are also strong enough for manufacturers to use in next-generation high-efficiency combustion engines. Oak Ridge National Laboratory’s Safe Impact Resistant Electrolyte (SAFIRE) improves the safety of plug-in electric vehicle batteries. In typical automotive lithium-ion batteries, the liquid electrolyte (which conducts the electrical current) poses a fire risk in high-speed collisions. To minimize this risk, current plug-in electric vehicles use heavy shielding that reduces their range and efficiency. In contrast, the SAFIRE electrolyte eliminates this risk by using an additive that transforms the liquid electrolyte to a solid upon impact. By blocking contact with electrodes, it prevents short circuiting and a potential fire. Under normal conditions, SAFIRE performs as well as conventional electrolytes. In vehicles, it has the potential to significantly reduce electric vehicle weight and increase travel range. Carbon fiber has historically been a high-priced specialty material, which has limited its widespread use. Oak Ridge National Laboratory’s Low Cost Carbon Fiber (LCCF) production method makes high-strength carbon fiber comparable to commercially available material at approximately half the finished product cost. It is also much faster than other methods and reduces energy usage by about 50 percent. Manufacturers can also combine LCCF with plastic materials to produce lightweight composites. This product can potentially make carbon fiber an affordable material for high-volume, cost-sensitive applications such as fuel-efficient automobiles and wind turbine blades. Lightweight materials such as aluminum alloys can help substantially increase the efficiency of vehicles and airplanes. ACE is a new family of aluminum alloys that exhibits better performance at high temperatures and is easier to cast than previous alloys. By combining aluminum and cerium, or a similar element, with traditional alloying materials, ACE is better able to resist corrosion and be stretched into wires. ACE alloys remain stable at temperatures 300 degrees Celsius higher than leading commercial alloys. They can also withstand 30 percent more tension before they deform. Manufacturers can successfully cast ACE alloys in a wide variety of structural components without energy-intensive heat treatments. Eliminating these treatments could significantly increase production output and reduce manufacturing costs in some cases by almost 60 percent. Click here for more ORNL technologies nominated as R&D 100 Award Finalists. Erlanger Health System is building a $13 million natural gas-fired energy system at its main campus which hospital officials believe will be a showcase project for cutting energy, expenses and pollution. Chattanooga’s biggest hospital plans to install the 8-megawatt Combined Heat and Power facility next year in a former incinerator building to generate most of the electricity and most of the hot water consumed in the 2.5-million-square-foot medical complex on East Third Street. 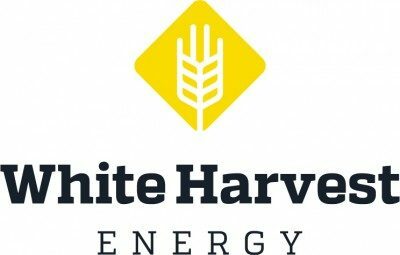 The Tennessee Valley Authority is providing $6.75 million to match the hospital’s investment under a green energy pilot program designed to encourage more efficiency through combined heat and energy facilities. “This is kind of perfect model for a CHP (combined heat and power) plant because we will be able to reduce emissions, create a more reliable energy source for the hospital with on-site generation and also save us a great deal of costs on our overall energy bill,” said John Loetscher, vice president of facilities, engineering and real estate at Erlanger who has been working on the project since shortly after he arrived at Erlanger in 2015. Since hospitals use a lot of steam and hot water around the clock, such facilities are ideal to capture the excess steam and heat generated in a power plant that produces steam to turn turbines to make electricity. The idea behind combined heat and power, or co-generation, is to capture the heat that would normally be wasted in electricity generation and supply it to local buildings as well. The new system is designed to achieve as much as an 80 percent efficiency, which is nearly double what some traditional power plants get from burning fossil fuel, making steam to make electricity and then distributing that power over long distances. By having its own generation, Erlanger also expects an extra layer of reliability to its power supply, which already has multiple connections with EPB, the local TVA power distributor, and its own diesel-fired generators for power in the event of an electrical blackout. An advanced energy trend is catching on in the Volunteer State as more cities make the switch to LED lights. 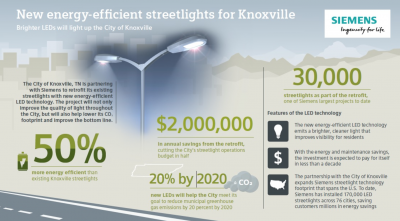 Knoxville’s City Council recently approved a contract to retrofit Knoxville’s nearly 30,000 streetlights with LEDs, setting the City on a path to significantly reduce carbon emissions, according to a release. Council approved a more than $9 million contract with Siemens. The company expects to begin installation of the new lights across the city in late 2017 or early 2018. All work is expected to be complete by June 30, 2019. 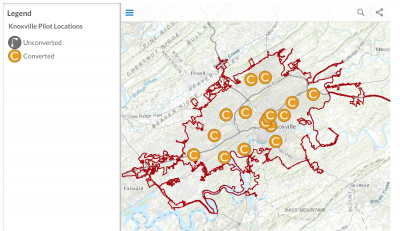 By retrofitting Knoxville’s streetlights to LED technology, the City will reduce energy use, and take a major step toward exceeding its goal of reducing emissions by 20 percent by 2020. “Infrastructure improvements like this are excellent ways for cities across the country to improve quality of life for their citizens, save a significant amount in energy costs and meet their sustainability goals,” said Marcus Welz, CEO of Siemens Intelligent Traffic Systems. City officials in Paris, Tennessee announced in February an energy efficiency project there will be launched. Leaders say they will be replacing more than 2,500 lights across the city to LEDs highlighting the project’s cost efficiency. “It’s just an opportunity to do something progressive in our community and switch everything over to LED,” said City Manager Kim Foster. Foster said they hope to start the process of replacing the lights in May, and this will be a continuing project over the next six to eight months. Putnam County, Tennessee received a Clean Tennessee Energy Grant, and the funds were used towards upgrading the county’s government buildings with more energy-efficient LEDs. The LEDs will be installed in the 911 center, the community center, the Putnam County Justice Center and agriculture buildings among others. The light bulbs began getting replaced in June 2016 and the county has until the end of this month to complete the project.